South Woodford is in North East London and can be easily reached on the central line. Cafe on the lane is roughly 5 minutes walk from the tube station. The outside seating area here looks great, with temperatures struggling to get above freezing though we head straight inside. The kitchen is located at the back, a row of small tables line each side of the cafe. A good selection of breakfasts are available all day. Don't forget to check out the surprise guests, the bubble & squeak is the star of the show! Everything you need is already on the table. A large Americano cost £1.80, a great mug of coffee and served piping hot. The headliner with black pudding and bubble & squeak added as extras came to £10.60. Here's a birds eye view of this impressive looking breakfast. On the left side was a pair of Cumberland sausages, some toast and a nicely cooked fried egg that really didn't need to be garnished. Taking centre stage was black pudding, mushrooms, tomatoes and some nicely reduced beans. Over on the right side was the bacon and some seriously impressive bubble & squeak. The delicious Cumberland sausages were plump and juicy. The bubble & squeak is served in two hefty slabs, the best I've ever tasted for sure! My wife chose the vegetarian summer solstice breakfast costing £6.50, she swapped the egg for extra mushrooms. Bubble & squeak, 1 fried egg, mushrooms, beans, tomatoes and toasted sourdough. Wow! Thank you so much for the comments, we are all passionate about our breakfasts. Well chuffed ! 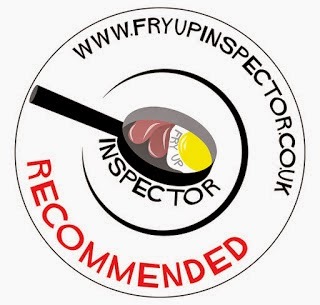 No 'Fry Up Inspector Recommended' sticker? They are eligible and I've offered them a sticker. If they want one I will send it and happily add them to the recommended section! I am a regular customer of the cafe and I can say the food quality and service are amazing. You will never regret after visiting there.